Q. 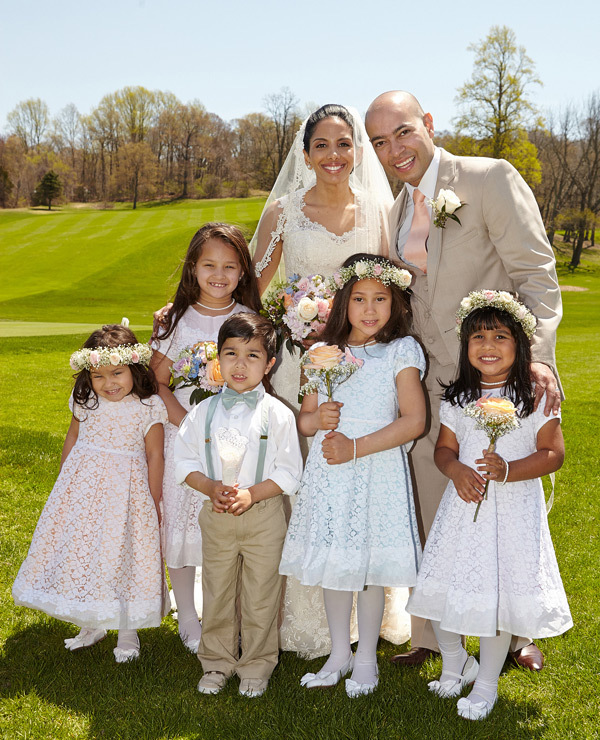 Looking back on your May 2014 wedding, what was your biggest challenge, Rosa? A. I come from a close family and wanted to include all four of my nieces and my nephew in my wedding. Because it was such a big group of flower girls, I got very involved in the dress selection process. I wanted to make each girl feel really special, so I made the oldest my Maid of Honor, the youngest my Flower Girl and the two middle girls Junior Bridesmaids. Because my wedding dress was lace, I wanted four lace flower girl dresses that were similar in style yet celebrated the uniqueness of each girl. Finding dresses made of the same fabric in different styles to accommodate a wide range of ages turned out to be a challenge. 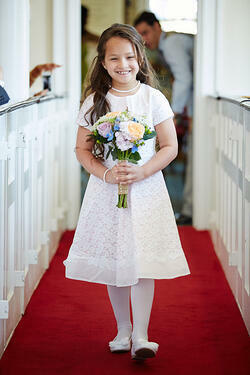 What made you decide to customize your flower girl dress with Isabel Garretón? 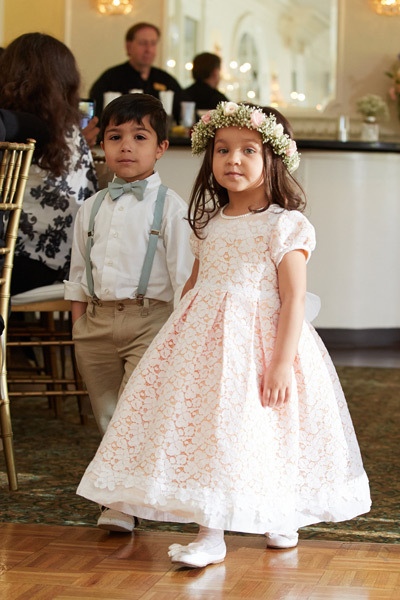 I work in Manhattan where I’m surrounded by the best shopping in the world, so I thought finding flower girl dresses would be easy. 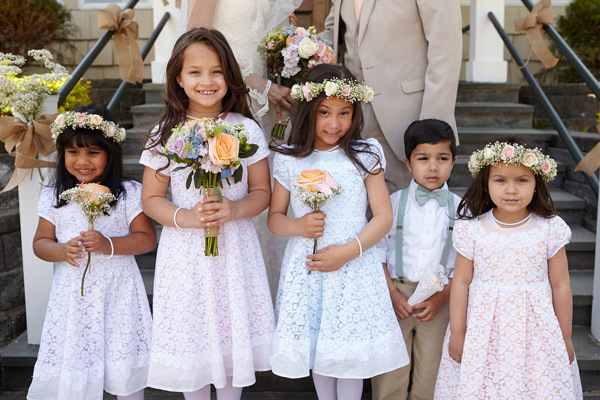 Instead, I searched for weeks and months, until finally, I walked into Saks Fifth Avenue and discovered Isabel Garretón’s elegant flower girl dresses. I work in the garment industry so I could immediately tell how amazing her quality is. I went online to see her entire collection and saw a note on the website that she could customize her dresses to do exactly what I wanted. I couldn’t believe it! 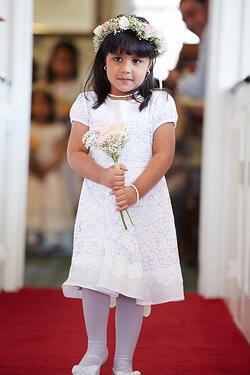 What was the process of customizing your flower girl dresses like? Surprisingly simple. First, Isabel Garretón sent me custom fabric swatches in my Pantone colors. I thought the first batch of colors looked a bit dark, so they gladly sent me more. I still thought they looked dark and then I held them in the air as if they were cascading down the aisle in my wedding and saw how beautiful the colors looked in the natural light. They were perfect. The experience was like going into a fancy wedding dress salon. They treated my wedding like it was the most important thing in the world to them. I provided the girls’ basic measurements, chest, waist, and shoulder to hem length. The dresses arrived in four weeks. That’s pretty fast considering they were handmade for me with custom linings in Chile! Tell me about your four flower girl dresses? 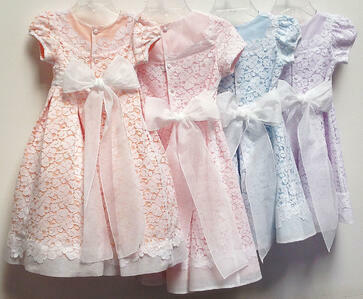 I chose the Gala and Blossom styles which use the same Floral Cotton Lace and Organdy with a big bow in the back. One was a tiny bit more expensive because it had a skirt that included a petticoat and was longer. 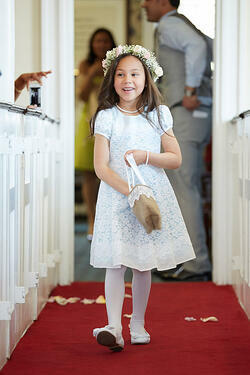 The smallest flower girl wore that dress. 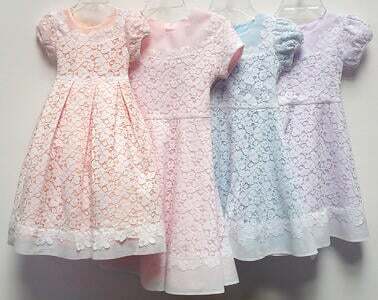 The other three dresses were worn by three cousins and featured the same waisted cut and flair skirt to the knee, a different sleeve - cap or short – and each dress had a different colored lining that peeked through the lace in tangerine, pink, light blue, and lavender. They were exactly what I was looking for. I had no idea Isabel Garretón is a social enterprise brand. 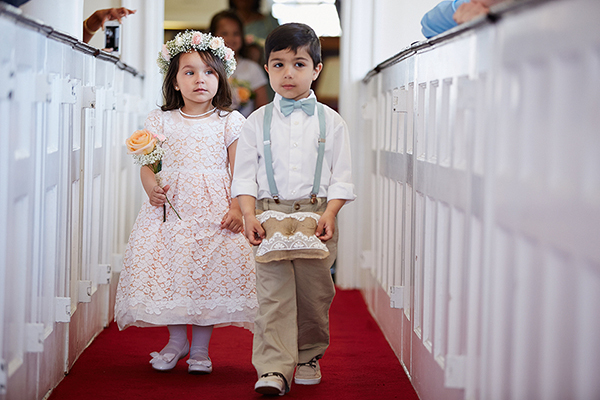 The dresses were such a good price ($180 each, which included the custom cut and lining) and I felt good that my flower girls were helping women in another country support their families. Isabel Garretón was so flexible every step of the way. I work for an apparel company, so I know how much work and trouble it is to make a beautiful dress like this by hand. These Chilean women truly are artisans. Did you learn any important lessons you’d like to share with other brides? I couldn’t believe a luxury brand like this offered customization with so much personal attention. I encourage every bride-to-be to try it! You’ll be so happy with the results.